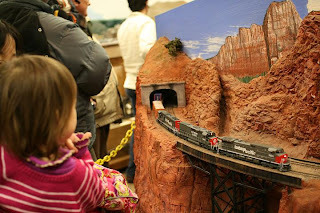 Since ningning mentioned trains in a comment to my post about the Holiday Train, let me write a little about trains for kids in the Bay Area. I'm sure that I don't know all of them, so if anyone knows more, please let me know. Here are the ones that we know. This train in the Vasona Park in Los Gatos is loved by all kids I know. The train ride is great and there are many other attractions in the park: the carousel, playgrounds, and ducks. I don't like this one too much but if your child is really into trains, it may be worth checking out. The train goes in a small loop. Adults cannot be on the train because it is a very small train. The Japanese Tea Garden in the same park is very nice. This place close to Santa Cruz has two train: the beach train that goes to Santa Cruz and the steam train that goes in a loop. Both are very nice. There are also some events there, like Day Out With Thomas, and Holiday Lights Train. 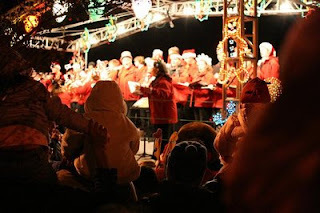 We went to the Caltrain's Holiday Train in the past and we will surely go this year. 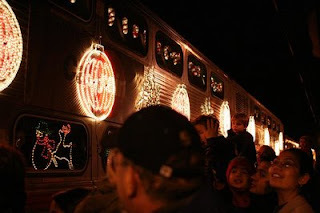 This year the train event will happen on December 6 and December 7, 2008 (note that different stations are served on each day). You can get all the details on the Caltrain web site for Holiday Train 2008. This is a very fun activity for small kids. The train stops at the station and you can watch performers on a platform car. Some characters (Santa etc) will get off the train and mingle with the crowds. If you choose to watch it in Santa Clara, make sure to check out the train museum there. The kids will love it! The Holiday Train is also about giving. If you can, please bring new toys and books. Your gifts will be donated to U.S. Marine Corps Reserve’s Toys for Tots Program and the Salvation Army. Candyland was suggested by Dafna in a comment to my Zingo post. According to the Wikipedia article, this game "has become a cultural icon in the U.S." And according to Board Game Central: "For generations, boys and girls have enjoyed Candyland as their first board game". I will definitely give it a try. Amazingly, it costs only $5 on Amazon: Candy Land - Milton Bradley Board Games.